The Recolour Drawing dialog box allows you to replace all instances of a colour or texture in drawings with a different colour or texture swatch in one of the scene's palettes. This replaces the colours or textures in the drawings without requiring you to modify the palettes. 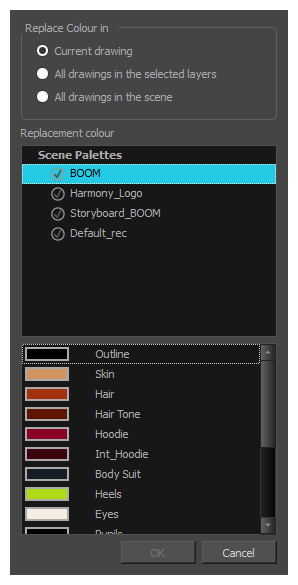 You can use this dialog to perform colour replacement in the current drawing, in all the drawings in one or several layers or in all drawings in your scene. This dialog will replace the colour or texture that is currently selected in the Colour view with the colour or texture that you select inside the dialog. Select the palette in which the colour or texture swatch is located, then select the swatch you wish to replace. If the drawing in the Camera or Drawing view contains the colour or texture you want to replace, select the Dropper tool in the Tools toolbar, then click on that colour or texture in the drawing. The Colour view will automatically select that colour or texture's palette as well as that colour or texture's swatch. Right-click on the swatches list, then select Recolour Drawings. Open the Colour view menu , then select Colours > Recolour Drawings. Current drawing: Replaces the selected colour in the currently selected drawing only. All drawings in the currently selected layers: Replaces the selected colour in all the drawings in the layer that is currently selected in the Timelime or Xsheet view. NOTE This option can work with several drawing layers selected. All drawings in the scene: Replaces the selected colour in every drawing in the current scene. Allows you to select the palette and colour or texture swatch to replace the selected colour or texture with.